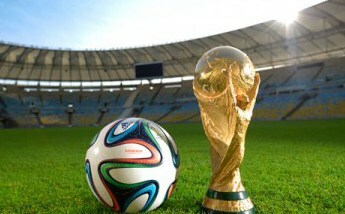 It's World Cup Time! As 2014 FIFA World Cup fades into memory and 2018 World Cup Russia dawns, a new round of world carnival time for football fans is about to begin! Go to the Europe and watch the 21st World Cup live matches? I bet you can't help using your HD camcorder to record the exciting 2018 World Cup matches. But when you come back home and wanna take UEFA　video off from HD camera for playback on mobile device or upload to YouTube sharing, what should you do? How to convert camcorder recorded 2018 World Cup video to MP4 without compromising any quality does rack your brain. Actually, my friend, it's not the pie in the sky. What you are wanting is a professional yet top-notch video processing tool. Here comes the must-have MacX Video Converter Pro, which is capable of transcoding camcorder recorded 2018 World Cup video to MP4 on Mac with original quality reserved attributing to its powerful High Quality Engine support. Apart from that, this program can also aid you to download UEFA Euro championship video to iPad iPhone so that you can appreciate some uncommon 2018 World Cup videos from official website or shared by other football enthusiasts. Fantastic resource sharing! Notes: MacX Video Converter Pro is especially designed to download and convert YouTube video on Mac or Windows If you are a Windows user, please head to the Windows converter edition to get the job done. 1. After free downloading this top video transcoder for macOS (macOS Mojave incl.) and run it, click "Add File" to load the recorded 2018 World Cup video files. 2. Select the output format you desire. In a bit to convert your recorded 2018 World Cup video to MP4 file, choose "to MP4" as your output format. 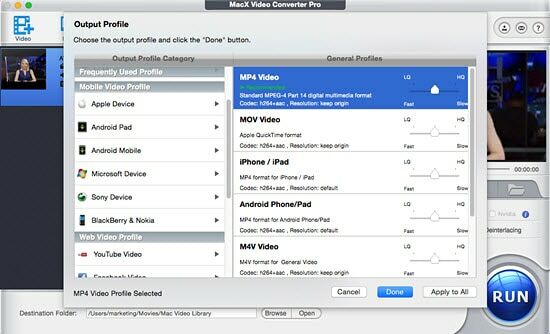 What's more, your presetting can be customized to make the output video look great on your player. 3. After finish the above steps, click the "RUN" button to start converting camcorder recorded World Cup Russia video to MP4 on your Mac. This software will automatically helps you finish conversion, and you could view the conversion progress and are able to cancel the process at anytime. Warm prompt: If you think this World Cup video converter only has the above mentioned features, then you will be definitely wrong. Besides transferring recorded 2018 World Cup video to MP4 with best quality, it also works well in downloading World Cup theme songs, video, movie free from YouTube, FB, Dailymotion, etc. 1000+ video sites and converting video to MOV, FLV, AVI, MKV, AVCHD, MTS, iMovie, iPhone, iPad, iPod, Samsung, HTC, Blackberry, Sony and so on with World's fastest speed. Fans can download and watch 2018 FIFA World Cup videos on iPhone iPad offline or use sports app to live stream World Cup video 2018 on iPhone iPad. Here's our how-to guide. Free download 2018 World Cup Russia videos, below is the fastest way to download the 21st Russia World Cup 2018 full game, videos, matches, highlights HD MP4 3GP AIV videos for offline viewing, editing etc. The hottest World Cup fans list is a stunning visual feast! This is your paradise. We pick out the sexiest female fans in the World Cup 2018 2014 of all time from Russia, Spain, Brazil, Mexico, Portugal and more countries. MacX Video Converter Pro offers top quality, easiness, fast speed and high-efficiency in HD 4K recorded World Cup video conversion for World Cup fans, for exmaple, MTS to MP4, M2TS to AVI/MOV, 4K to 1080P, etc.